Through a unique collaboration between higher education and a faith-based community, student entrepreneurs challenged themselves to bring their best business ideas forward in what may well be the first ever business pitch contest of its kind. 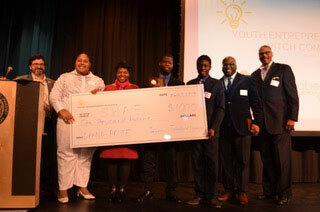 On March 7, teams of high school students pitched their concepts on stage at Lawrence Technological University’s campus in the Southfield City Centre during an event sponsored by Centrepolis Accelerator and Tabernacle Missionary Baptist Church in Detroit, funded by a grant from the New Economy Initiative (NEI). The competition allowed students to gain plenty of business know-how, Sanders says. “When you learn about business, you learn math, computer science, how to work in a team, finances, pitching, developing a website, funding, equity, and investment. So regardless of whether you go on to launch a business, you’ve experienced a lot of learning through this event,” he says. In first place was a product called Scholarship and Homework Aid Finder, or SHAF, an app that helps students get ready for college through support for finishing homework, and searching for colleges and financial aid sources. The winning business concept took home $1,000 in cash and $5,000 in LTU scholarships. The second place award of $500 in cash and $2,500 in LTU scholarships went to StressLess Funerals, a website designed to support families who have lost a loved one. In third place, winning $375 in cash and $1,750 in scholarships is a product called Slashguard that helps stop toilet flush splashing. Other pitched ideas ranged from toys embedded in soap to encourage bathing for small children, an online network for suicide prevention, a biometric gun lock to prevent accidental shootings, and a shoe-leasing business for high-end designer footwear. Sitting on the judging panel were Lee Gaddis, founder and CEO of Gaddis Gaming, a Detroit-based gaming table manufacturer; Lee Gorman, owner of Barton Consulting Services LLC, an Ann Arbor business consulting firm; and Belinda Turner-Dubois, loan officer at CEED Lending, a small business lending center of the Center for Empowerment and Economic Development, an initiative of the Great Lakes Women’s Business Council. Part of the business pitch experience were four Saturday bootcamp-like coaching sessions with Jackie Stavros and Matt Cole, who are professors in Lawrence Tech’s College of Business and Information Technology, and Sibrina Collins, executive director of LTU’s Marburger STEM Center. The high school participants toured LTU’s campus, visited the Detroit Food Academy at Eastern Market to learn about youth-run food businesses, and stopped off at Tech Town, the midtown Detroit-based startup accelerator. 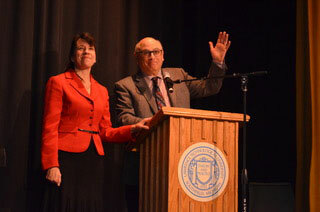 “Tech Town is within a few minutes of Tabernacle Church, and it really exposed the students to all the entrepreneurial resources available there,” says Sanders. Overall, the faith-based student pitch contest highlighted the need for more engagement with high school and middle school youth in entrepreneurship. 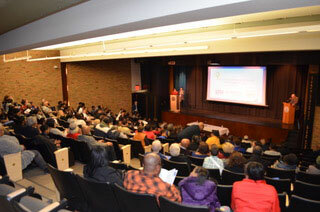 The high turnout for this event is an indication of its value for the educational, business, and faith communities.